Preheat oven to 425°F. In a large bowl toss baby carrots with the olive oil and garlic. Sprinkle well with salt, pepper, and thyme. Place carrots and garlic in a 9x13 pan and bake for 35 minutes or until tender. Make sure to stir halfway through baking. While carrots are cooking start cooking the pasta al dente according to package directions. Make sure pasta water is well salted. Once carrots are done, remove from oven and place in a blender or food processor. Add the Parmesan and cream and puree until smooth. Add 1 to 1 1/2 cups pasta water to blender until sauce is to desired consistency. Drain pasta and add to a large bowl. Add carrot cream and frozen peas and stir until well combined. Crumble bacon on top and stir to incorporate. Top with additional Parmesan cheese and serve. Popeye ate spinach and Bugs Bunny ate…you got it, Bunny Carrot Cream Pasta. This recipe, Adapted from Cinnamon Spice & Everything Nice, features a pasta sauce like no other creamy sauce I’ve eaten before all because of one secret ingredient (okay so maybe the title gives it away). That’s right, carrots! Roasted carrots are pureed with Parmesan and cream to create a velvety sauce with a slight touch of sweetness similar to a butternut squash. As I tried to get my kids to guess what the secret ingredient was, I was a little disappointed that my kids had no idea who Bugs Bunny even was! The carrot cream gets its flavor from roasting the carrots in the oven with some garlic and thyme. Sure you can peel and cut your own carrots, but I used frozen baby carrots which are perfectly peeled and cut to save some time. Cooked carrots can be mushy and bland, but see how once the carrots are roasted they start to caramelize. That’s just the flavor we want for our carrot cream sauce. Toss in some peas and savory bacon and voila, dinner is served. What a great way to sneak in some veggies into your family dinner! Just leave out the bacon to make a vegetarian version of this pasta for your veggie lovin’ friends…or Bugs Bunny. 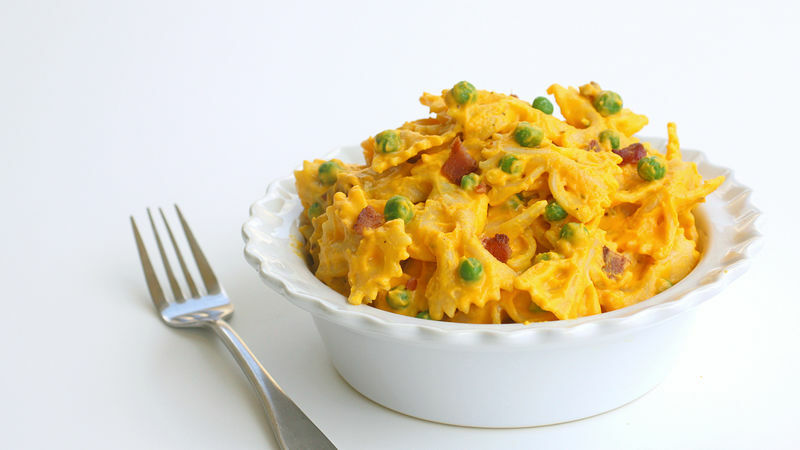 Keep the kids happy with even even more pasta recipes they'll love!